Industry 1st's in motorcycle comm! BM-SF: The SF Series...Meeting the Communication Needs of Every Rider. The SF Series was designed to give riders the exact features they need for their ideal riding scenario. The SF1 allows for 1 Bluetooth connection to a smartphone, MP3 player or GPS while both the SF2 and SF4 offer Intercom functionality. All SF models include brand new capabilities such as Audio OverlayTM, Quick Charging and microphone mute option features. The SF Series boast a a sleek and low profile design that will fit on almost any helmet. BM-SF1: Bluetooth Connectivity for Those Who Ride Solo. Whether you're commuting to work or primarily ride solo, the SF1 has you covered. The SF1 was created to give solo riders all of the awesome Bluetooth features that they need, without the ones they don't. The SF1 pairs to your phone allowing for music streaming, taking and making phone calls, and hearing turn-by-turn GPS directions. The SF1 also allows VOX Phone commands. BM-SF2 & SF4: Rider to Passenger or Small Group Communication. For riders looking to communicate with their passenger, the SF2 provides simple Rider to Passenger 2-way intercom communication up to 800 m (880 yards) in open terrain. For those who ride in small groups, the SF4 is equipped with 4-way intercom over 1.2 kilometers (0.8 miles). Both models let riders enjoy smartphone connectivity. Riders can listen to music and use the intercom simultaneously using the Audio OverlayTM feature. Please note that Audio Overlay works best with Android devices, while iOS offers limited functionality. BM-30K: 30K Bluetooth Headset. The 30K is on an entirely different playing field than the legacy of Sena communicators that came before it. It still has integrated 4.1 Bluetooth capability so that it is backwards compatible with other Bluetooth communicators but the 30K employs 2.4 GHz Adaptive Mesh-Networking Technology. Bluetooth is limited by pairing hierarchy and daisy chains, 2.4 GHz is not. Riders with 30K are free to roam. As long as distance and line of sight is maintained, no one rider from the group can disconnect and break the connection of other riders within the group. Within 30K there are no chains. BM-20S, BM-20SD: The 20S is a state-of-the-art motorcycle and powersports Bluetooth communication system. The unit provides a sleek and aerodynamic design that offers a versatile jog dial that maximizes the ease of use for riders. 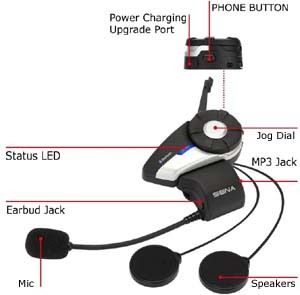 The 20S features several industry firsts for the motorcycle Bluetooth communication headset market. One industry first is the introduction of Bluetooth 4.0 technology with dual Bluetooth communication modules, to create one of the most advanced Bluetooth headsets in the market. The new Bluetooth technology increases the performance and reliability of the headset while also allowing for increased high definition audio quality. The advanced Audio Multitaskingâ„¢ allows for a seamless blend of incoming and outgoing audio to create a mixed audio experience versus the traditional interruption based audio technology of other Bluetooth devices. BM-20SCB: Helmet Clamp Kit For Harley CB / Audio. 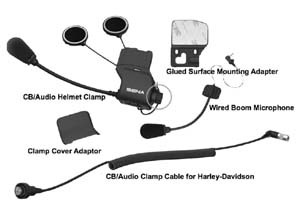 Bring all of the sound of your onboard audio system right into your helmet with the BM-20SCB Helmet Clamp Kit. 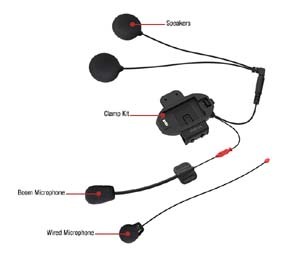 The adapter cable with 7-pin DIN plug connects the onboard audio system to the helmet clamp and allows users to listen to the onboard audio system, including FM radio and GPS navigation. The CB radio retains full functionality via use of the integrated PTT switch/button and clamp kit microphone. When paired up with a main module, all sounds - CB radio, GPS navigation, and FM radio - from the onboard audio system can be mixed with sound sources, including intercom, MP3 music, and phone. 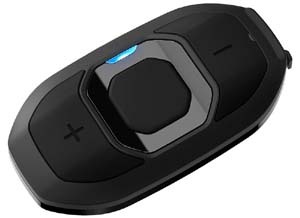 BM-FW: The BM-FW Bluetooth Motorcycle Adapter allows you to wirelessly connect your Harley-Davidson entertainment system to your Bluetooth headset. The BM-FW included teh cord for your motorcycle.. 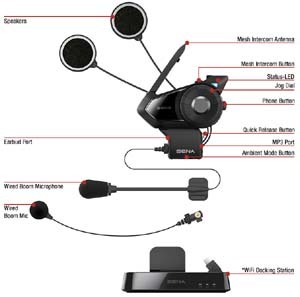 REMOVE ALL RESTRAINTS FROM YOUR RIDE: Hear your bike the way it was meant to be heard: Wirelessly. When you connect the BM-FW to your Harley-Davidson, you can utilize all of the bike's infotainment features that you love - WIRELESSLY! Communicate via CB radio, hear turn-by-turn directions from the GPS system, rock out to your favorite radio stations and so much more - all through your Bluetooth headset. 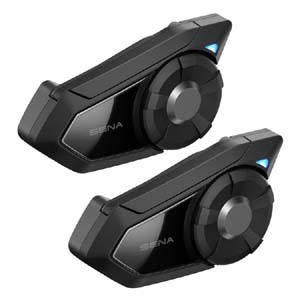 Use an additiona BM-FW for your passenger to talk over the motorcycle's internal intercom system - All with the wireless freedom you've been longing for. 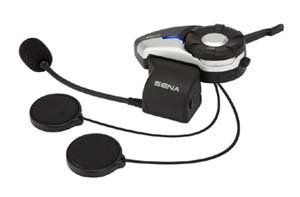 ENHANCE YOUR EXPERIENCE: Listen to your bike through the BM-20S-CB and take advantage of even more incredible audio capabilities from Sena. 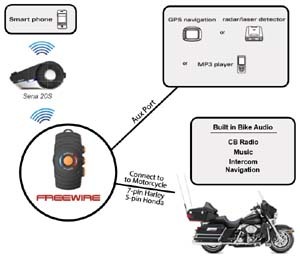 Thanks to the BM-FW, you can wirelessly connect to your Harley Davidson infotainment system while also being able to utilize the various capabilities of the Bluetooth headset. 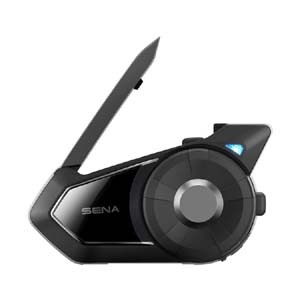 Enjoy a 2 km intercom between up to 8 riders, HD Audio, Voice Command, Group Intercom, Advanced Noise Control, the Sena Smartphone App and so much more. APPLY ALL OF YOUR ACCESSORIES WITH EASE: Use the AUX import to hear additional inputs alongside your bike. The BM-FW also has a 3.5mm AUX port which allows you to directly plug in additional accessories such as a GPS device, radar detector, non-Bluetooth MP3 player and more - allowing you to hear them alongside the motorcycle's infotainment system through your Bluetooth headset speakers. STAY CHARGED AND SECURE: Easily accessible mounting and charging accessories make your ride worry free. The BM-FW comes with two different mounting accessories, a handlebar mounting kit as well as a mounting cradle for on the bike itself, to conveniently secure the device during your ride. 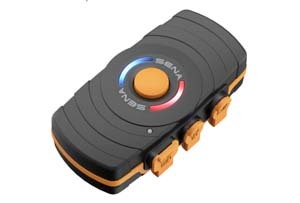 The unit automatically powers on/off with your motorcycle's engine for maximum convenience, and for longer rides you can easily charge your FreeWire while using it with the included cigarette charger or Sena Powerbank. Only available with the 30K Wifi Pack.